Etta Mae Mitchell, 94, Carthage, MO, passed away Friday, October 5, 2018 at the Sarcoxie Nursing Home. She was born on November 9, 1923 in Rowe, Ok to the late Vernon Hankla and Alice (Owens) Hankla. She married Claude Mitchell Sr. on May 15, 1923 in Lamar, MO he preceded her in death on July 18, 1973. Etta worked in retail at TG&Y and later for Ramsey’s in Carthage. She was a member of the Grace Episcopal Church of Carthage, and the Order of the Eastern Star. 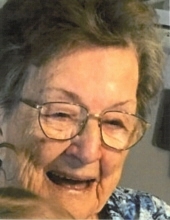 She enjoyed Music, ceramics, and gardening. Survivors include one daughter, Karla Amaro (AL), Wichita, Ks; a son, Claude Mitchell JR. (Cindy), Carthage, Mo; eight grandchildren, and several great and great-great grandchildren. She was also preceded in death by a daughter, Barbara Borland, a son, Richard Mitchell, and a grandson Jeff Hard. Graveside services will be held at 2:00 pm Thursday October 11, 2018 at the Ozark Memorial Park Cemetery under the direction of the Knell Mortuary. Online condolences may be expressed through http://www.knellmortuary.com.